Location and site analyses at their core are really about managing risk first and maximizing opportunity second. Thomson Realty Limited believes that location and site analyses at their core are really about managing risk first and maximizing opportunity second. Most any retail business or land development or condo project will survive and prosper in the good times. It is during the economic down cycle side that is the test of a location and site. Thomson first asks and answers two fundamental question and they are: “Is it the A location and site?” and “Will it work when the economy and other opportunities are or will not?”. Good location and site analyses makes for good decisions as we all know. They help provide good insurance that your choice will work when times are less than perfect. This is where Thomson can help its customers and clients most. Analytic methods, geo-demographic and econometric models to help knowledgeable buyers, sellers, landlords and tenants better understand the realty commitment being considered. 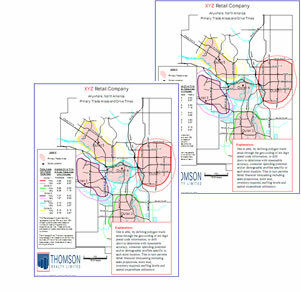 Making Thomson’s knowledge, experience and large network work for your real estate location and site decision.